How's All the Work Going to Get Done? How's All the Work Going to Get Done? How's All the Work Going to Get Done? is the only book currently available that presents solutions to the trauma that naturally and inevitably follows massive organizational change. It offers battle-fatigued managers and executives a fresh, cutting-edge description of what each of them can do...right now...to produce results, even if the odds are stacked against them. This book's real-world studies and solutions can be applied immediately by anyone who supervises anyone else -- whether he or she is at a huge conglomerate, a small business, an entrepreneurial growth company or a nonprofit. Title: How's All the Work Going to Get Done? Description: 223 pp. 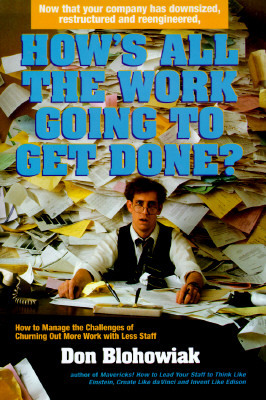 A practical guide written by a New York corporate executive for managers struggling with workloads in downsized companies. Keywords: BUSINESS. WORKPLACE. ORGANIZATION. SCHEDULING. MANAGEMENT. LABOR. DOWNSIZING.